Do you find it hard to say “no” to that begging face, or too easy to give in to those meows? A few treats here and there are no problem, as long as it is balanced with an adequate amount of exercise. Read on for more information about pet obesity. Pet obesity is a growing problem in Canada, similarly to humans, and it is caused by an imbalance between caloric intake and caloric output (exercise). Obesity is defined as a pet that weighs more than 20% above its ideal weight. For an “ideally” 10 lb cat, that means a gain of only 2 lbs to qualify it as obese. Determining an ideal weight for a pet can be difficult due to breed and individual variation. Unfortunately there are no body mass indexes for animals. The best way to determine if you pet is an ideal weight is to use body condition scoring. Body conditions can be scored on a 5 point scale with halfway being ideal weight and 5/5 being grossly obese. You can score your own pet easily at home by feeling over their ribs, which should be palpated easily with slight pressure. Looking at your pet from above they should have a waist, instead of being a straight line from shoulder to hips. Viewing your pet from the side their abdomen should tuck up. Long haired animals can sometimes be deceiving, so it is best to use touch instead of sight to determine if their tummy does tuck and the amount of fat covering over their ribs. Similarly to us, obesity in pets comes with its own risks. Obesity puts pets at an increased risk for osteoarthritis, type II diabetes, respiratory disorders, heart disease, kidney disease, liver disease in cats, many forms of cancer and increased risk of complications during anesthesia and surgery. If you are concerned about your pet’s weight it’s a good idea to consult with your veterinarian to determine an ideal weight, diet and feeding regimen that works for you and your pet. 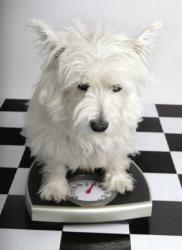 Your veterinarian can also help rule out medical conditions that can result in weight gain. It is important to slowly decrease caloric intake for obese cats since they are prone to developing a condition called fatty liver if food intake is decreased too quickly. Another important part of the weight loss equation is exercise. It is recommended for a dog to have at least 1 walk a day of 20 mins along with 10-15 mins of play time, such as a good game of fetch. For some dogs this may mean a faster paced walk with less sniffing. The increase of more cats being strictly indoors means that owners have to become more creative with keeping their cats active to keep their weight down. Feed the portion recommended by your veterinarian or on the food packaging and separate it into 2-3 feedings daily. Each feeding can be split into three and placed in three different parts of the house. Feeding your cat on a raised area will force them to have to jump up to get their food. A dog’s food bowl can be moved up or downstairs so that they have to walk to get to their food. Food balls can be purchased from a pet store where kibble is placed in a plastic ball that the animal must move around to get some of the food to spill out. Try skipping the treats and trade them for affection, playtime and catnip. Set aside 10-15mins daily for playtime with your cat such as chase by dragging a cat toy behind you or fetch with a favourite toy. Weight loss does not happen overnight and it does require a great deal of patience and persistence on your part. Weekly weigh-ins are a good way to monitor success! Once an ideal weight is reached the new exercise routine should be continued, but caloric intake needs to be altered to maintain your pet at their ideal weight. What better time to start a new exercise regime with your pet then during the beautiful sunny months of summer!